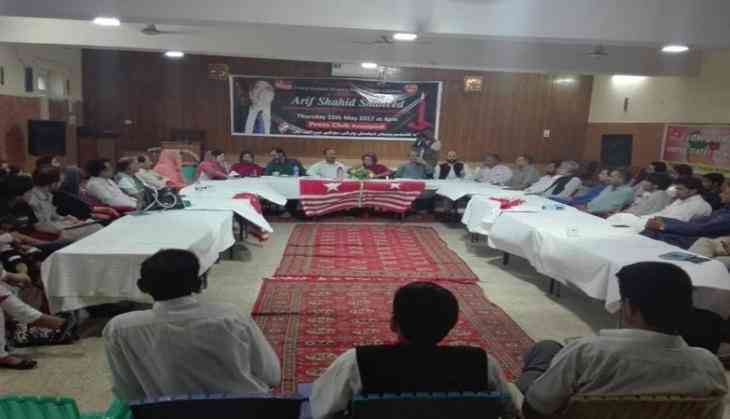 Kashmiri leaders recently held a meeting at the Rawalpindi Press Club to pay tribute to their slain nationalist leader Arif Shahid and to condemn the Pakistani security forces for his death. Shahid, a pro-independence Kashmiri leader, criticized Pakistan's policy of treating Kashmir as its 'colony' during his lifetime. He was shot dead by unidentified gunmen in the high-security area of Rawalpindi in May 2013. Four years after his death, people are still demanding justice and punishment for his murderers. The 63-year-old leader was the President of Jammu Kashmir National Liberation Council. He was at the forefront of the movement to free the disputed territories of Pakistan-administered Kashmir and Gilgit Baltistan under Islamabad's illegal control. In the meeting organized by the United Kashmir People's National Party or UKPNP, the leaders urged Pakistani authorities to not use their land for terrorist activities. They also expressed concern regarding the situation in Gilgit Baltistan where political workers face intimidation and hardships. Sabir, Chairman of Liberation Front (Raul group) said while addressing a meeting, "They think that they can target the innocent locals who wish to fight for their rights. They wish to put bullets in them. They should be ashamed of themselves. We have been struggling for the past 70 years and are victims of their injustice and misrule". Over a 100 delegates from across Pakistan, PoK and Gilgit representing different nationalist parties took part in the event. They also expressed Islamabad's nefarious designs to make Gilgit Baltistan as its 5th province although the region is not a constitutional part of Pakistan. The participants also raised the issue of political workers facing intimidation and hardships in Gilgit Baltistan and Pakistan occupied Kashmir (PoK) as many of them are facing sedition charges. Serious concerns were also shown by activists over exploitation of their territory in the name of China Pakistan Economic Corridor (CPEC). The multi-billion dollar infrastructure project will pass through Gilgit Baltista, which is an occupied territory.